Open internet is the most important challenge for our global institutions and governments. 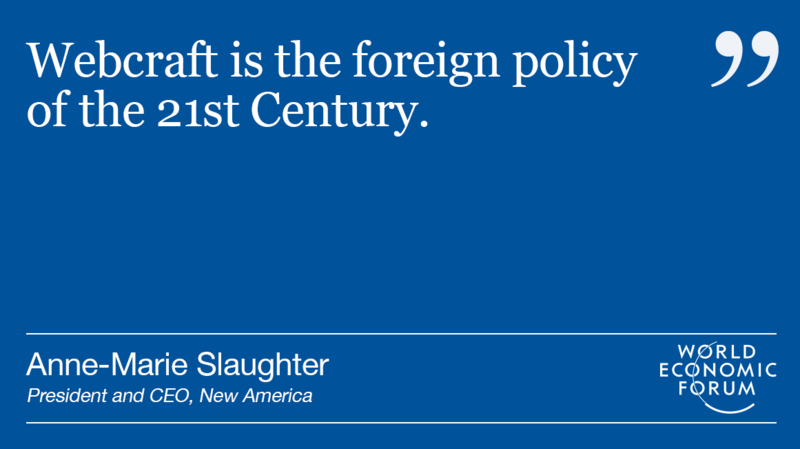 As statecraft proves less and less able to solve or even tackle global problems, it is time to turn to webcraft. Statecraft is the traditional world of diplomacy, treaties and international institutions, with decisions traditionally made by statesmen (they were mostly men) in embassies and elegantly panelled foreign offices around the world. Webcraft is the foreign policy of the 21st century, a sprawling complex of networks, coalitions, partnerships and initiatives undertaken by business, NGOs, churches, universities, foundations, cities, provinces and very determined individuals, all working with, alongside or sometimes against their national governments. Political scientists and foreign-policy pundits are lamenting the decline of the "liberal international order," by which they mean the complex of international institutions created largely by the United States and its allies in the aftermath of the Second World War. The United Nations, the World Bank, the International Monetary Fund, the World Trade Organization, the OECD and a host of other related global groups are simply no longer what they once were, even if we remove the rosy glow of nostalgia. The Paris Agreement on climate change was a triumph for global diplomacy, but it produced a framework according to which countries will bind themselves to a set of rolling emissions targets over time, far from the traditional commitment to a binding set of defined obligations under international law. It is also the first global agreement to be reached since the international Mine Ban Treaty and the convention establishing the International Criminal Court in the 1990s, although the world has plenty of threats demanding attention. Terrorism, trafficking, environmental degradation of land and sea, food and water shortages, pandemics, corruption, failed states, migrants and refugees, and violence of all sorts are all on the list. Webcraft starts from the proposition that while the international order is a world of sovereign states – the only actors alongside international institutions recognized as subjects of international law – the world that we actually inhabit, as opposed to constructing in our minds and on paper, is a vast web of intersecting networks. Imagine a map of the internet, or of the world at night with corridors of light crisscrossing continents, and you get the idea. In that world, anyone can initiate and pursue global action, as terrorists, traffickers in drugs, arms and people, and other criminals know all too well. It helps, of course, to have power and influence domestically. Two of the best examples of effective webcraft were initiated by the Gates Foundation and Bloomberg Philanthropies. The Global Alliance for Vaccines and Immunization (GAVI) has, by its own estimate, contributed to the immunization of nearly 640 million children. It brings together foundations and multilateral organizations to work with developed- and developing-country governments, civil-society organizations, the global pharmaceutical industry and research and technical institutes around the world. The Gates Foundation and other philanthropies provide funding, pharmaceutical companies develop vaccines, the World Health Organization regulates vaccine quality and civil-society organizations implement immunization programs. On the climate side, Bloomberg Philanthropies has spurred and funded the creation of the Global Covenant of Mayors for Climate and Energy, which connects and mobilizes government and non-government actors in more than 7,100 cities around the world to reduce carbon emissions and mitigate the effects of climate change. Those mayors played an important role in pushing for the Paris Agreement and are now at work implementing it, regardless of their national governments. Donald Trump announced that he was withdrawing from the Paris Agreement on June 1, 2017 (an act of statecraft). Hours later, former New York mayor Michael Bloomberg tweeted: "We can't wait for national governments to act on climate change. For solutions, look to cities." The next day, 30 mayors, three governors, more than 80 university presidents and 100 business leaders began negotiating with the UN to have their submissions of commitments to reduce carbon emissions accepted alongside other countries' (webcraft). Note that GAVI is an "alliance," while the mayors' organization created by Bloomberg defines itself as a "global covenant." Those are classic terms of diplomacy: States enter alliances and make covenants. And in the liberal international order, they set the global agenda and control the degree of action or inaction. That order may well be in decline, paralyzed by the sheer number of governments that must agree on anything in a world of nearly 200 states, riven by stalemates between rising, returning and status-quo great powers. But another order is emerging: around, above, below and through the chessboard world of states. It is much messier and harder to see. But it holds the promise of being far easier to shape, or at least to penetrate. The two orders can and will come together. Indeed, mayors and other actors are actually recognized in the Paris Agreement as "non-party stakeholders." They cannot be "party" to the agreement under international law, but participating governments recognize these other players have stakes in the outcome and increasingly engage them in various ways during negotiations. Individual governments are also recognizing the value of creating and connecting to web networks themselves. China's grand strategy of One Belt, One Road, designed to renew land and sea trade routes from China through Southeast and Central Asia all the way to Europe, envisages a world of commercial, security and cultural networks in which all roads lead to Beijing. The European Union is keeping pace. In its 2016 Global Strategy for Foreign and Security Policy, it proposes to act as an agenda shaper, connector, co-ordinator and facilitator within a networked world. Canada itself is ahead of the game, certainly with regard to its southern neighbour. The Liberal Party's foreign policy paper Canada In The World is subtitled A Global Networks Strategy. It aims to gain influence through "connectedness," collaborating with governments, non-governmental organizations, the private sector and demographic niches ranging from Canada's youth and academia to faith-based groups and artists. Connecting, however, requires openness – within societies and across borders. The definition of "closed" is to sever and block connections. To be part of the global internet, a state has to allow its citizens to connect to it. For citizens and other web actors to organize globally, they must be able to find and connect to their counterparts in other countries. The condition of open or closed, then, will be the fault line dividing the global order that is emerging, a divide that will be just as salient as the divide between capitalist and communist countries during the Cold War. Fighting for openness – for people, goods, services, knowledge, and communications – and creating the domestic and international conditions in which it can thrive is the most important challenge for our global institutions, our governments and all of us.